Investment casting is one of the oldest known metal forming techniques, dating back over 5’000 years ago when beeswax was used to create the pattern. Beeswax back then didn’t allow the accuracy and intricate shapes we can produce today. Investment castings are used in a huge array of items, golf clubs are investment cast, aeroplanes use investment cast parts as do cars and other motor vehicles. To begin the process wax patterns are made by injecting hot molten wax into an aluminium die, this sets the wax pattern to the exact size and shape of the required part. Many of these wax moulds are attached to a wax sprue which forms a stem linking all of the individual moulds together. Once the sprues are filled with the mould attachments they are dipped into a cleaning bath to ensure the future layers of shell cling to the mould profile correctly. Before the first layer of the shell is added the sprue assembly is dipped into a bath of slurry, this will form the bonding agent to the layer of ceramic powder which is added in either a rainfall sander or a fluidised sand bed, this process gradually builds up a ceramic shell around the moulds and sprue, with progressively coarser layers of ceramic coating being added over several coats until the desired shell thickness is achieved. After the ceramic thickness is achieved the sprue along with its moulds are oven baked to both harden the ceramic shell and to melt all of the wax from within it, this will include all of the wax moulds and the wax sprue leaving a hollow ceramic shell. 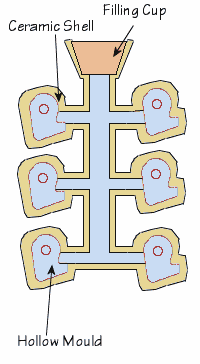 The wax moulds once melted leave a perfect void of the desired mould to be cast, the sprue once melted leaves open channels for the liquid metal to flow and fill all of the hollow shell (see image below). The molten metals are poured into the now hollow ceramic shell via the filling cup and left to cool off. Once the metal has cooled sufficiently the ceramic shell is broken up by either being submitted to vibrations or a water jet. Investment casting offers a number of advantages, the first being the excellent surface finish achievable, although of course the mould itself must first have these finishes. Investment casting leaves no parting or flash lines and the high quality finishes mean that the expense of another machine process to clean up surface finish is rarely required. High dimensional accuracy is achievable which again can save a big cost on later machining to bring parts within the required tolerances. Almost any metal can be investment cast and there is very little material waste from the process, any defect parts can usually be melted down and re used. Investment casting has the potential to create extremely intricate parts; the molten metal will run and fill the mould very neatly, and because the castings mould is broken up to be retrieved there is little constraint to the shape of a casting. The creation of a mould can be fairly expensive and time consuming, a lot of labour is also required throughout the rest of the casting process. 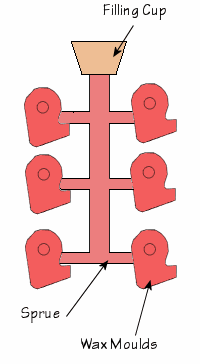 Occasional defects do occur for example air pockets within the casting.